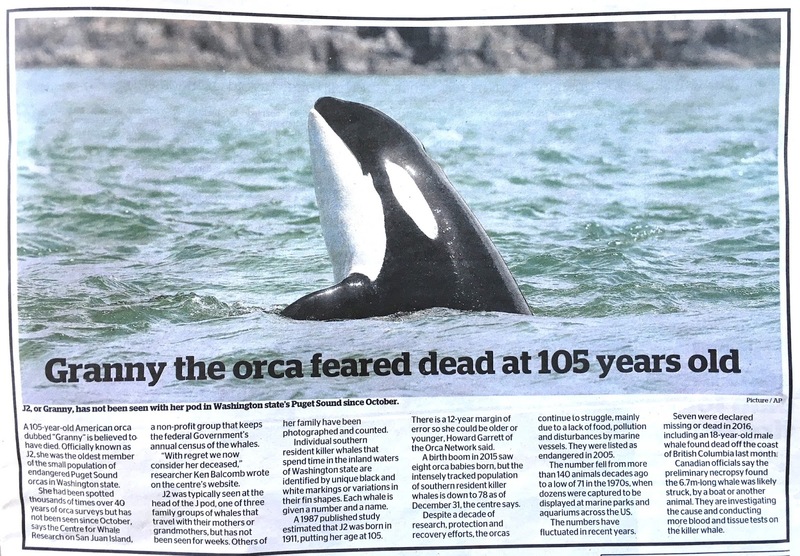 Further to the last post, which mentioned orcas as one of my 2017 bucket-list wants, today brings this report in the local paper - about J2, leader of one of the three small pods that live in Puget Sound and are tracked by the Centre for Whale Research on San Juan Island - at Friday Harbor, where I spent a few nights in 2010. It was when I was poking around the Whale Museum there that an announcement was made that orcas had been spotted on the other side of the island (possibly the incredibly ancient Granny and her family). So off we dashed to the prime viewing spot to stand, hopefully but sadly in vain, gazing out over the glittering waves looking for that unmistakeable fin. It was to be a pattern. So many places I've been, where orcas hang out, including here in Auckland Harbour, and how many have I seen? Zilch. Or, almost zilch. I'd just got settled on the ferry to the city last month when the captain announced, offhandedly, "Oh, by the way, those orcas are still over there, on the left." Of course I dashed out on deck, to see, way over near the rocks, three big fins just discernible against the white of their splashes. All I had was my phone, so the photo is crap. I'm not that bothered, though, since I reckon the sighting was so distant, and brief, that it doesn't count. It just rubs it in that fate is conspiring against my getting a proper viewing. I mean, people have told me about orcas hunting stingrays right beside the wharf at Matiatia, tossing them up out of the water - even, once, coming right to the beach to retrieve a ray that had been thrown too far. And these three, you know, had been circling the bay, swimming right past the wharf, while I was sitting inside, reading the local rag, totally unaware. Bummer.